This end user license agreement (this “eula”) is a binding agreement. By installing or using the Application that is the subject of this EULA you acknowledge that you have read this EULA, that you understand it, and that you agree to be bound by its terms. If you do not agree with the terms and conditions of this EULA, do not accept this EULA and do not install or use the Application. 1. Grant of License. 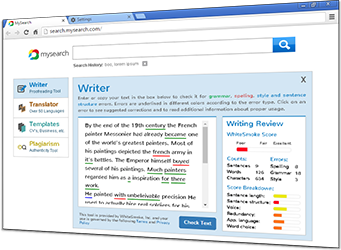 WhiteSmoke Software Ltd. and WhiteSmoke INC (“Licensor”) provides an application with a grammar correction algorithm for use in the Microsoft Word or Outlook environments (the “Application”). The Application also allows you to perform internet searches using your default browser without leaving the Microsoft Word document or Microsoft Outlook email Message. Subject to the terms and conditions of this EULA, Licensor grants you a non-exclusive, non-transferable license to install a single copy of the Application on your computer and use the Application solely for your own personal needs. 2. Restrictions. Except as expressly permitted hereunder you may not, nor may you assist other parties to (a) copy, modify, or create derivative works of the Application or part thereof, (b) distribute, sell or transfer the Application or part thereof or sublicense your right to use the Application hereunder, (c) reverse-engineer, disassemble, or attempt to derive the source code of the Application or part thereof, or (d) attempt to disable or circumvent any security or access control mechanism of the Application. You may not use the Application in violation of any applicable law or regulation. 3. Ownership. You have no ownership rights in the Application. Rather, you have a license to use the Application only so long as this EULA remains in effect. Ownership of the Application and all intellectual property rights therein shall remain at all times with Licensor or its licensors. No rights are granted hereunder by estoppel or by implication. All rights not granted to you herein are reserved to Licensor or its licensors. Any references to the sale or transfer of the Application herein or in any other communication between Licensor and you shall mean only the license of the Application pursuant to the terms and conditions of this EULA. You will not remove, alter or conceal any copyright, trademark, service mark or other proprietary rights notices incorporated in the Application. All trademarks are trademarks or registered trademarks of their respective owners. Nothing in this EULA grants you any right to use any trademark, service mark, logo, or trade name of ours or any third party. You have no obligation to provide us with any feedback concerning the Application. Nevertheless, if you provide us with any feedback concerning the Application, you also provide us with a non-exclusive, perpetual license to make all uses of such feedback without obligation to you. 4. Data and Privacy. The Application may collect and save the text that you type when using the Application. The Application may collect and save your contact list, including names, emails and telephone numbers. The Application may also automatically collect technical information concerning your computer, mobile device, browser, IP address and operating system. 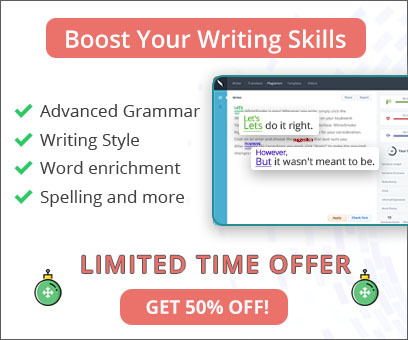 Licensor may use such data in order to provide the services to you, and in order to customize or personalize the services, for example in order to improve word prediction, grammar correction, etc. In addition, Licensor may use any of the foregoing data to provide targeted advertising and promotional offers to you, including without limitation by means of links, in which Licensor believes you may be interested. Licensor may use any of the foregoing data to create statistical data that does not identify any individual user. Licensor may provide any or all of the foregoing data to its commercial partners, only in connection with the provision of the services. Licensor may use third parties to store and process any of the foregoing data, and such third parties may not be located in your jurisdiction. Licensor will disclose any of such data as required by law or pursuant to a legitimate law enforcement investigation. Licensor may disclose such data to a party that purchases Licensor or any of its businesses. 5. Warranty Disclaimer. The Application is provided “AS-IS”. Licensor expressly disclaims any warranties with respect to the Application. Licensor disclaims any statutory or implied warranties of merchantability, fitness for a particular purpose, title or non-infringement. No warranty is made that the Application will meet your requirements, that the operation of the Application will be continuous or error-free, that the Application will operate as intended or at all under all conditions, or that any defects in the Application will be corrected. 6. Limitation of Liability. In no event shall Licensor be liable to you or any other entity for indirect, special, incidental or consequential damages (including, but not limited to, loss of profits, loss of data or loss of use damages) as a result of the Application or the use thereof, even if Licensor has been advised of the possibility of such damages or losses. The liability of Licensor for the Application shall not exceed amounts actually paid by you to Licensor specifically for the use of the Application. As such, if you have not made any payments to Licensor specifically for the use of the Application, Licensor shall not have any Liability to you. Licensor may make available updates of the Application from time to time. Licensor shall have no liability hereunder for versions of the Application for which all available updates have not been installed. 8. Indemnification. You shall defend, indemnify and hold Licensor (and its affiliates, employees, officers, directors and agents) harmless from and against any and all losses, liabilities, costs and expenses arising out of or connected with any third party allegations (even though such allegations may be false, fraudulent or groundless) that you breached any provision of this EULA, or any representation or warranty made by you herein. Notwithstanding such obligations, Licensor may control any defense of such claims. If Licensor allows you to defend such claims, your choice of counsel must be reasonably satisfactory to Licensor. You shall not settle or compromise claims that impose any obligation on Licensor or admit any fault on the part of Licensor without its prior written consent. Licensor may participate in the defense of all claims with counsel of its own choice at its own expense. 9. Support. Licensor may provide support and updated provisions in its discretion. Licensor may cease providing support and/or maintenance at any time in its sole discretion. Only Licensor (and no other party) shall be responsible for the provision of any support or maintenance for the Application. 10. Termination. This EULA shall terminate if you violate its terms. Upon termination, you must immediately cease use of the Application. Sections 2 – 12 of this EULA shall survive the termination of this EULA for any reason. 12. General. This EULA shall be construed, interpreted and governed by the laws of the State of Israel without regard to conflicts of law provisions thereof. Any action, suit or other proceeding arising under or relating to this EULA shall be brought in a court of competent jurisdiction in the district of Tel-Aviv/Jaffa, Israel, and the parties hereby consent to the sole jurisdiction of such courts. The rights and obligations of the parties to this Agreement shall not be governed by the United Nations Convention on the International Sale of Goods. Any waivers of any condition of this EULA must be in writing, and the waiver of any requirement in certain situations or circumstances shall not be interpreted as the waiver of such requirement in other situations or circumstances. This EULA constitutes the entire agreement between the parties hereto. Any amendment or modification of this EULA shall only be effective if it is in writing and signed by both parties hereto. If any part of this EULA is found invalid or unenforceable by a court of competent jurisdiction, such provision shall be interpreted as necessary to give maximum effect to its provisions and the remainder of this EULA shall remain in effect. Licensor may assign or transfer any of its rights or obligations hereunder without your consent. You may not assign any of your obligations or rights hereunder. Licensor communicates with its users electronically and on-line and, as such, you consent to receive all communications and notices electronically from Licensor (including through the Application) or to an email address that you have provided to Licensor. All such communications or notifications shall be considered as having been provided in writing. You represent and warrant that: (i) you are not located in a country that is subject to a U.S. Government embargo, or that has been designated by the U.S. Government as a “terrorist supporting” country; and (ii) you are not listed on any U.S. Government list of prohibited or restricted parties. Licensor reserves the right to update or modify the Application at any time, from time to time in its sole discretion, including without limitation to increase or change functionality of the Application. Licensor may cease providing or maintaining the Application at any time. Duplicate of Thank you for joining WhiteSmoke!